There is a huge range of glasses to choose from and there are new designs available each season. 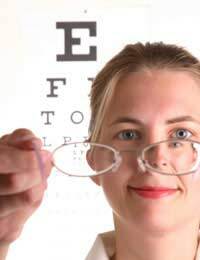 Your optician will be able to give you advice and help you find frames to suit you and your lifestyle. They will ensure they are fitted correctly and are comfortable for you to wear. You could always take a friend along to help you choose. Lightweight metal frames with just a hint of colour are best for people with fair skin. Tortoise shell frames often look good on those with pale complexions. Brightly coloured frames should be avoided as they can make you look even paler they generally look better on darker people. The easiest way to remember what style will suit your face shape is that the frames should compliment, not match the shape of your face. So totally round glasses will not suit someone with a round face. People with oval faces are lucky as almost all frames will suit them. Slightly elongated and square frames are best for people with a round shaped face, as they will help to highlight the upper face. So-called heart shaped faces will look better in more delicate glasses or rounded or high cheekbones look best with rounded glasses or frames with a strong top line. Choosing frames to suit is never an exact science so break the rules and pick what makes you feel good. Some people have several glasses to match different outfits or occasions. If you have children, particularly young children, it would be worth selecting frames which will do not break easily. Special frames are available which bend and then spring back into shape. Normal frames can be very fragile and if they get broken accidentally they can be expensive to repair or even replace.